One household chore that is not going anywhere is laundry. A quote I read a while ago will always stand true, “Laundry today or naked tomorrow”. My mother use to say something similar growing up. Everyone has laundry to complete. We all have dreamt of having a gorgeous laundry room that would make this household chore more enjoyable. These laundry room ideas are big or small depending on your laundry room budget. There are simple laundry room organization tips and tricks to make completing laundry more enjoyable and efficient. Even if you do not have a first or second-floor laundry access, you can use these laundry room ideas to inspire you. If you want to learn more life hacks that save you time and money join our private Facebook group Live Life Better. How do you make laundry easier by using the space you have? The cube organizers have become very popular over the past few years. Most of the time you will see them in a room for additional storage with the storage cube bins. Before reading this article from Simply Designing, I would never have thought to put the organizer on its side or hang it on the wall. 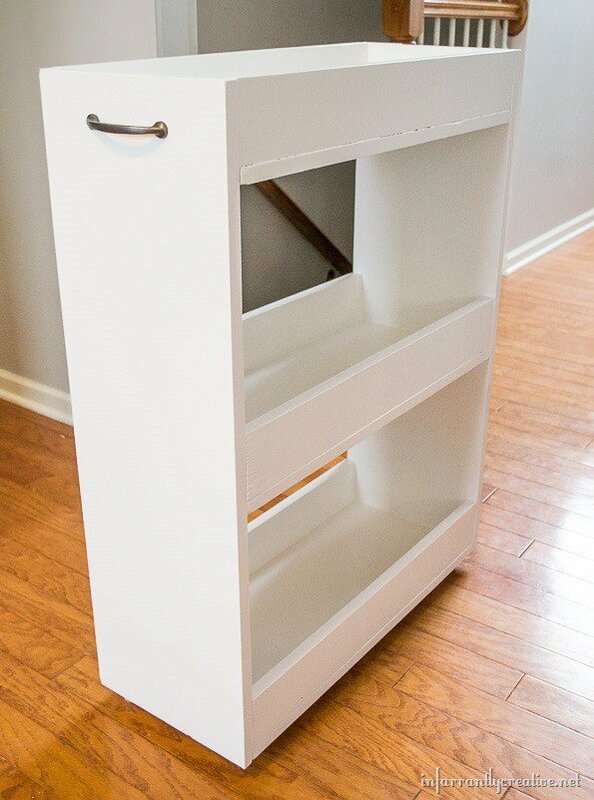 Such an ingenious idea that offers so much storage. We often don’t think about upward storage outside the kitchen. Very brilliant! I don’t know about you, but I spend a majority of my folding time of clothes on my bed watching tv. It is the only space I have available. I keep dumping the clean loads onto the bed and then spend the night folding. Kelan comes up for bed and there is no room for him immediately because of all the clean clothes folded. Having a designated place where I could fold immediately after taking clothes out of the dryer would make this task a lot easier and efficient. I love the idea of using a butcher block of wood. Most people have a garbage in their laundry room. They would use this garbage for lint and used dryer sheets amongst other disposable items. 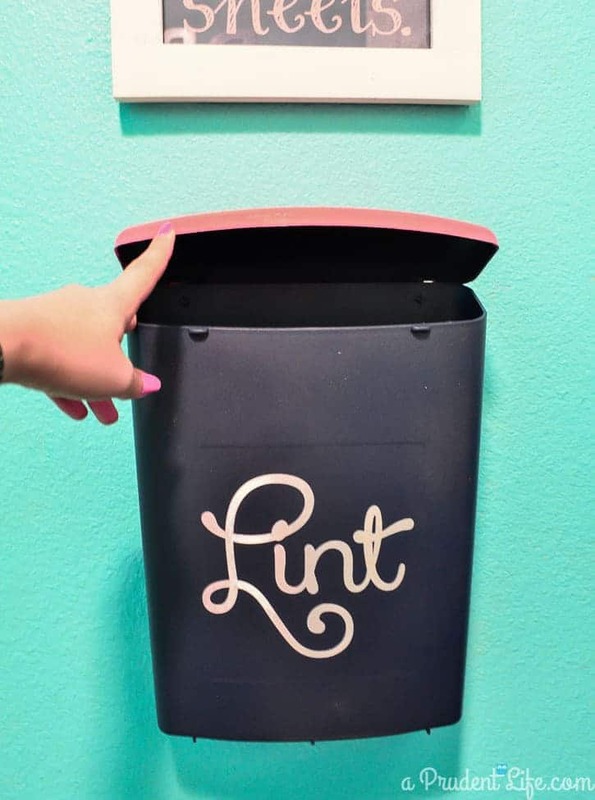 Some people might not understand this hack of using a decorated container to collect lint. In our house especially, we go camping during the summer. Great campfire starters are toilet paper rolls with lint packed in the center. By having a designated place to put lint instead of into the garbage can makes this camping hack very simple to complete. Growing up, I never understood the concept of missing socks. I just thought it was because I grew up with brothers. How could so many socks be missing? It wasn’t until I moved out on my own and started to do my own laundry that I was experiencing the missing socks phenomenon. 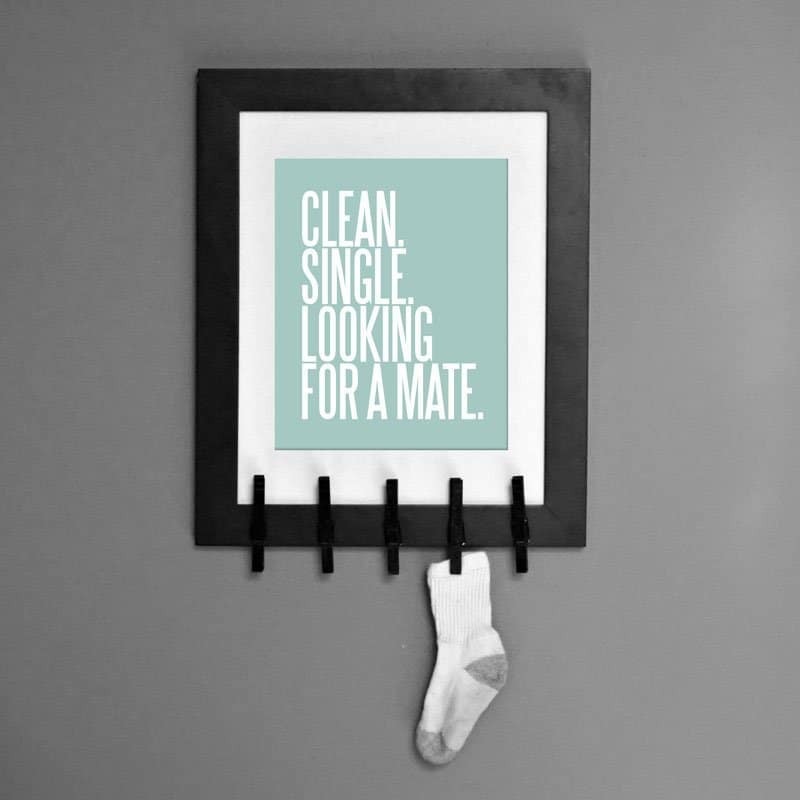 Currently, missing socks who are looking for their pair gather on top of the dresser in the hopes to find their missing mate. I love the idea of having a place designated for missing socks to be displayed so you can visually see what socks are missing. I am a sucker for unique hardware. I have seen kitchen hardware with forks, knives, and spoons! So different. I love that idea. 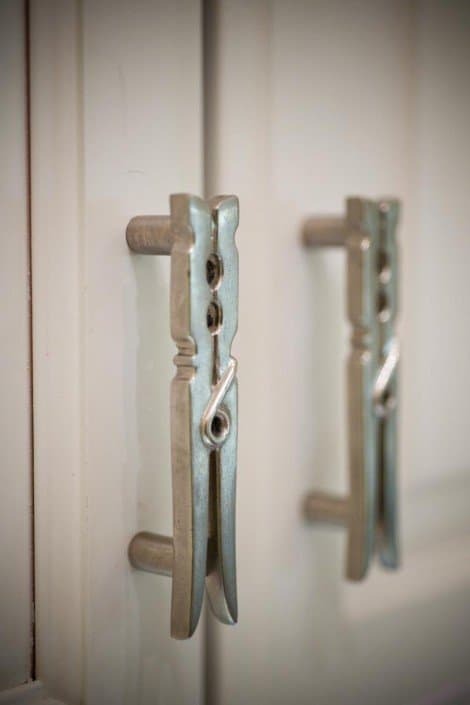 If you have cabinet doors in your laundry room that are standard, spice them up a bit. These clothespin hardware takes your boring cabinet doors in your laundry room and makes it homier. A simple and inexpensive upgrade to your cabinets. 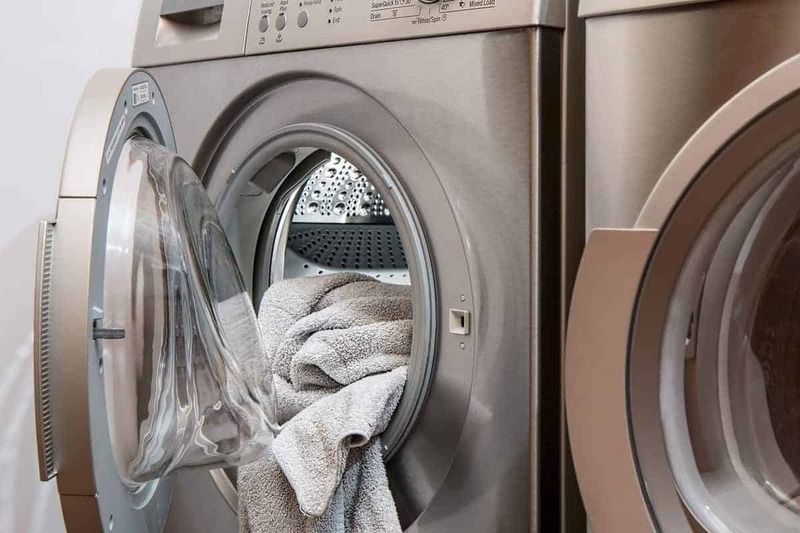 Many homes have some space either between or on the outside of washers and dryers. Use this space to your advantage and create a cart that rolls out similar to the one above made by Infarrantly Creative. This laundry room organization tip is perfect to make the most use of the space you have in your laundry room. Place bottles of detergent or fabric softener along with other everyday laundry items that you can grab in arms reach away on this organizer. She takes you step-by-step through the process of creating this awesome laundry room idea. We have our ironing board open in our basement and it takes up a lot of space. 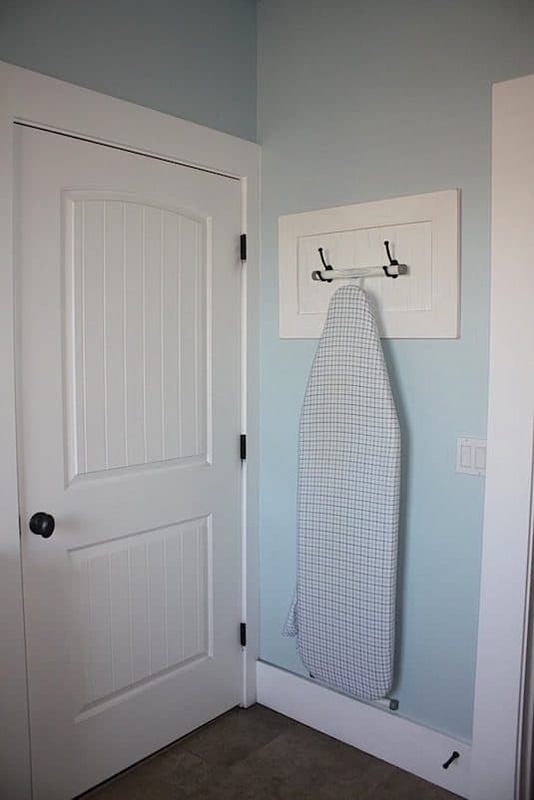 Being able to hang the ironing board and take it down when it needs to be used is a perfect space saver. If you are like us, we don’t iron any of our clothes unless they are extremely wrinkled. 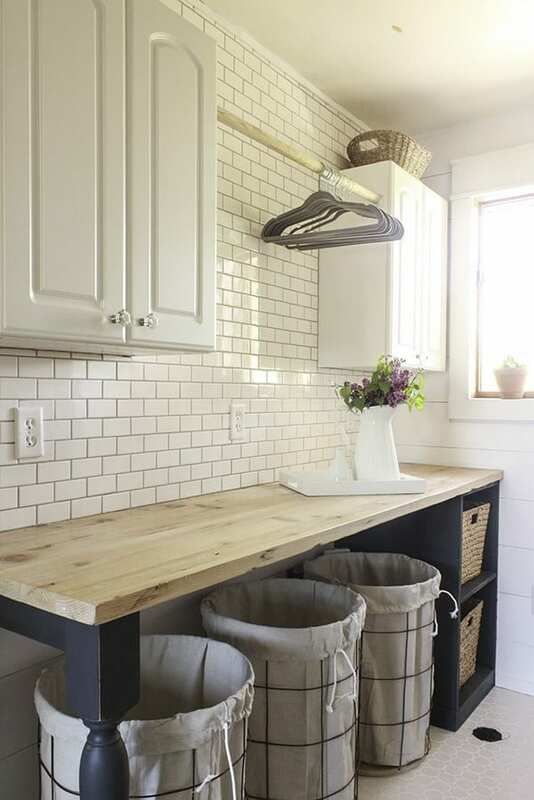 This laundry room idea is perfect for you if you are like us and have a small space. I have always loved the look of old-fashioned cookie jars. They are so versatile and make for a great organizational storage solution. Why not dress up laundry detergent and fabric softener in storage containers that are better to look at than the store jugs? I have seen many different ideas of storage containers on Pinterest. Search and use the best one that works for you and your laundry room. P.S. – Make sure to keep these out of reach and sight from children! 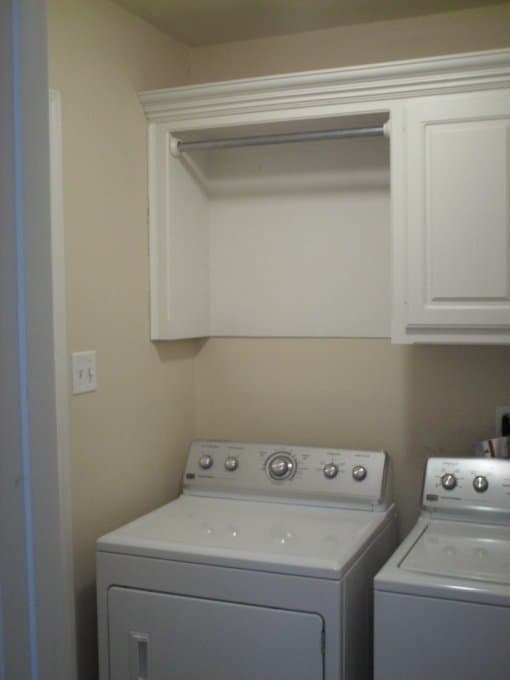 We have our dryer in our basement so this laundry room idea is definitely for a future resource for us. 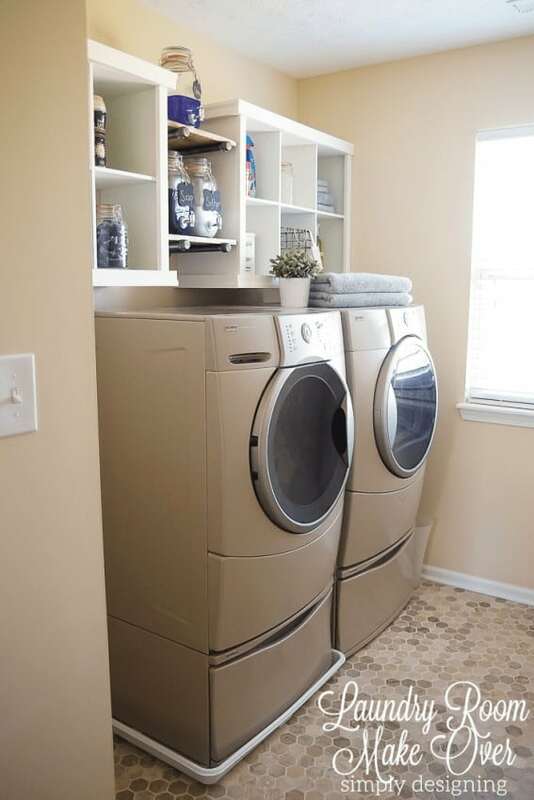 If you currently have your dryer on the first or second floor you are definitely going to want to implement this laundry room idea so your dryer is flat up against the wall like your washing machine. Again, this idea is a little more expensive but totally worth it in the end. These laundry room ideas will hopefully inspire you to rethink your laundry room. One way to increase your productivity and efficiency with doing the chore of laundry is to rethink your space. Happy washing and drying! Please, anyone reading this, DO NOT decent laundry tablets into old fashioned sweet jars. That is so irresponsible. Children are meant to be learning that these things are dangerous, putting them in sweetie jars does not put that message across. Countless children have died by swallowing laundry tablets. They should certainly be put away and out of reach! Totally agree. Totally agree! Very dangerous to leave out where kids could get their hands on them. 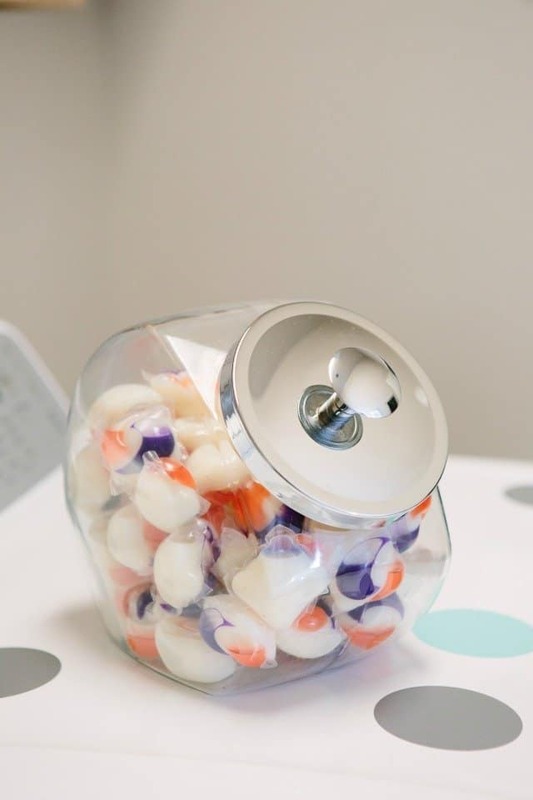 Yea, don’t leave those laundry pods out laying on the playroom floor, put them in a cookie jar so kids know they are yummy. Stupidest idea I have heard yet. Totally agree that leaving them out would be a terrible idea! Obviously putting them out of reach is a MUST. It’s a simple way to keep them organized and easy to know how many you have left. Keep your good ideas coming. Adult readers must discern for themselves whether or not the ideas will work in their household. 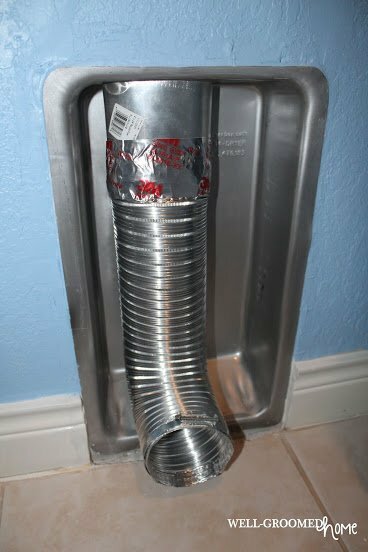 If you’re too immature and irresponsible to do this around your children without putting the canister in a place they can’t get to it, then you probably are too incompetent to do your own laundry. For us big people…that is a great idea.